But after the home goals, the health goals and the family goals, there is one that stands out the most. And though she be a small word, she be a mighty and powerful one too. This may seem strange, but I think we do a good job at loving in secret. I love my husband to pieces. I love my precious children. And I love my amazing friends. But sometimes the love I have for them doesn’t transfer to actually loving them. Do I just think and talk about loving them? Or do I follow-through and love them? Do I fill the gas tank when it’s below E? (I am working on that.) Do I turn off the vacuum to have a tea party with my Izzy-girl? Or, here’s a hard one- do I love myself by only allowing positive words to come out of my mouth despite what I see in the mirror or through the media? My #1 resolution for 2014 is to LOVE…… by actually loving through my actions. I wonder how many of my 36 other resolutions will just naturally fall into place if #1 is conquered? 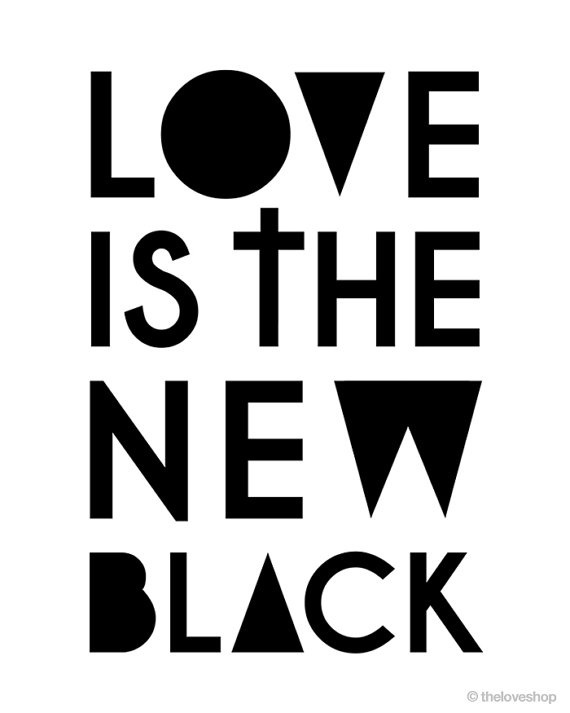 So, LOVE is the new black in my world. And believe you me, I adore black. I adore that “it-doesn’t-matter-how-fat-you-feel-if-you’re-wearing-black-you-be-a-skinny-fool”. But this year, LOVE is the new must-have. Try it on, why don’t you? By nature I am a deep thinker; I am an INWARD dreamer. Goals and dreams keep me awake at night and dance within my heart all day. And for me personally, it can be quite frustrating when the dreams… the giftings… the goals feel like they are hidden and buried. But isn’t it humorous (not really...) that the one thing that frustrated you can become the one thing that you’re AFRAID TO STEP OUT OF???? It can get comfy in that there hiddenness. You can cry and wish and dream to not be hidden anymore, until BAM! There comes a moment when the Lord ever so softly says, “It’s time”. And you’re like, NO WAY! I’m too comfy packed under this soil, God. I like it here! If I begin to bloom, than I will expose myself to all the elements…..to getting stepped on. If I stay hidden, then I can continue to dream about the flower that I WANT to be, rather than facing the reality of the flower that I WILL BE. But God does not give us dreams, only to bury them. He plants them in fertile ground where they can grow deep and sturdy roots. He sows them in the depths of the soil, where they are safe from the scorching light of attention, or the choking thorns of pride. God plants our dreams and gifts so they can one day flourish. God is tending to your gifts because He has a purpose for them. So embrace it. And when He softly asks you to bloom (aka: step out in faith), cling tightly to this truth: You do not serve a wasteful God. He gave you every one of your gifts, because He intends to use them. It’s SPRING BREAK 🙌🏻 and this Mama is balancing a new business with kids at home all week. This is the first time in 6 years that I haven’t had to take PTO. To say that I’m thankful is an absolute understatement. Ima gonna go have myself a little cry right now. Brb. 😭 . . Anywho- because I’m a nerd- and I know that it works- I created a schedule for us this week so that I can still get everything done for ATD and so there’s room for FUN too!! We also have time set aside each day to organize and CLEAN our house. Anyone else get a thrill when your baseboards are dusted??? 🤷🏼‍♀️🔥 . . Have a wonderful week everyone!!! The sun is out today and it’s making me want to do ALL THE THINGS!! I am just itching to plant flowers and seeds in my garden! . . Last year a friend of ours gave us this playhouse (originally from Costco) and oh how fun it was to create Izzy’s own space with it! Even funner (🤪) is that the gate was garbage picked and the fencing is an old daybed frame that I also garbage picked. The window boxes are from the dollar store and I found the plants on a “these are already dead but you can buy them for cheap” cart at Lowe’s. This year we want to add a chandelier in the tree and some more flowers as ground cover. Can’t wait!! !